The location is near every tourist spots and restaurants,and just next to the famous Elephant house. Value for money,spacey and very complete equipments. Everything. Easy access. Immaculate. Spacious. Well equipped. Comfortable beds. Location. Just perfect. Fantastic location, nice clean and modern apartment. We had a wonderful stay! Loved everything! Thanks so much for offering us such fine accommodation! Great location, beautiful view with the Castle from our apartment, good amenities, recently renovated, we really felt like home. I loved everything, including the size, decor, cleanliness, location, having a washer/dryer, etc. The views from the windows were spectacular. Bathroom & kitchen are very modern, and the bed was super comfy. The Patisserie downstairs was excellent, either for pastries & coffee/tea or breakfast. Location was great - a short walk to the Royal Mile, Grassmarket, National Museum of Scotland, etc. The apartment was beautiful and immaculate, with a fabulous view and location. Restaurants within 2 blocks were excellent. Lock in a great price for No. 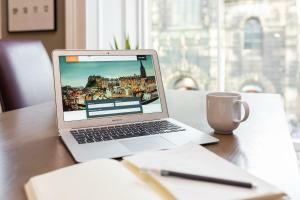 1 Apartments - George IV Bridge – rated 9.2 by recent guests! No. 1 Apartments - George IV Bridge This rating is a reflection of how the property compares to the industry standard when it comes to price, facilities and services available. It's based on a self-evaluation by the property. Use this rating to help choose your stay! Located just off the Royal Mile, Destiny Scotland - George IV Apartments is a stunning development a 5-minute walk from Edinburgh Castle. Free WiFi is accessible throughout. The accommodations is fitted with a satellite flat-screen TV, a well-stocked kitchen and an iron. There is a seating and/or dining area in some units. Bed linen is offered. Many flats offer stunning views of Greyfriars Kirkyard, Edinburgh Castle and the entire Old Town. Edinburgh Military Tattoo is 1,000 feet from George IV Apartments. The nearest airport is Edinburgh Airport, 6.8 mi from Destiny Scotland - George IV Apartments. Old Town is a great choice for travelers interested in old-town exploration, atmosphere and history. This is our guests' favorite part of Edinburgh, according to independent reviews. This property also has one of the top-rated locations in Edinburgh! Guests are happier about it compared to other properties in the area. This property is also rated for the best value in Edinburgh! Guests are getting more for their money when compared to other properties in this city. 뀐 Located in the real heart of Edinburgh, this property has an excellent location score of 9.7! When would you like to stay at No. 1 Apartments - George IV Bridge? This apartment features a seating area, tea/coffee maker and electric kettle. This apartment has a tea/coffee maker, electric kettle and dining area. Area Info – This neighborhood is a great choice for travelers interested in old-town exploration, atmosphere and history – Check location Excellent location – show map Guests loved walking around the neighborhood! Stay in the oldest part of Scotland's capital, where gas lamps light up elegant buildings and cobblestone streets. Nearby, the impressive Edinburgh Castle looks over the city. House Rules No. 1 Apartments - George IV Bridge takes special requests – add in the next step! A GBP300 damage deposit is required on arrival (around USD388.15). This deposit will be fully refunded at check-out, as long as there isn't any damage to the property. All children under 12 years are charged GBP 15 per night for extra beds. No. 1 Apartments - George IV Bridge accepts these cards and reserves the right to temporarily hold an amount prior to arrival. Sofa beds are only available in specific flats and are subject to availability. If you require the use of a sofa bed, please contact the property at least 48 hours prior to your arrival. There are private parking options available central to most of the apartments. Spaces are subject to availability on a first-come, first-serve basis. Please contact the property directly for more information. When booking 4 or more apartments, different policies and additional supplements may apply. A damage deposit of GBP 300 is required on arrival. That's about 388.15USD. This will be collected by credit card. You should be reimbursed on check-out. Your deposit will be refunded in full by credit card, subject to an inspection of the property. Please inform No. 1 Apartments - George IV Bridge of your expected arrival time in advance. You can use the Special Requests box when booking, or contact the property directly using the contact details in your confirmation. Excellent central old town location with easy access to Museum, Castle and Mary King's Close attractions. Easy access to Station (didn't need it), bus tours and airport bus shuttle. Many local eating options, also easy to eat in. Easy to check in, with no keys, codes on main door and property door. Excellent location. Great Apartment, very clean, trendy, excellent amenities. Faultless. The sign of the accommodation was not that easy to be seen especially in the evening/night. The hotel can just add the information of “just besides the Elephant House” so customers can find it more easily. It must be the best accommodation I ever had in the UK! Even better than my flat when study here. The location was like dream. 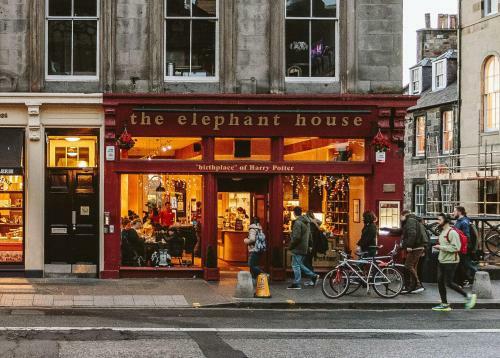 Just in Old Town of Edinburgh city, near the famous “Harry Potter birthplace” - The Elephant House. 5mins walk to Royal Mile and 20 mins walk to Edinburgh Castle (because too many things attracted me in the way to the Castle). The apartment itself was nice and neat and warm and cute. Facilities were perfect. And the decoration was really homelike. It was very convenient for checking in and out as well, even no staff was there. In a word, so lucky to have several nights there! Absolutely everything. The decor is beautiful throughout, the ease of accessing the property was first class, thoughtful additions e.g. some nice easy reading books, kitchen additions, earplugs, the best of all GHD Hair Straighteners. Lovely decor, well equipped, clean, central. The only negative is regarding the noise at night . We were woken during the night whilst scaffolding was being erected at a property close by and then by early morning delivery vans. There is also a club 2 doors away which was fine until closing time! Fantastic location just a 2 minute walk from the Royal Mile. The apartment was very tastefully decorated. Comfy bed, huge tv, cosy sitting room. A real home from home feel about the place and lovely and clean. The welcome hamper is a nice touch. Everything was perfect for me right from the beginning till the end. The location is lovely, the entrance door just next to The Elephant House, which is famous and well known so you won't get lost. The place was clean and so neat, facilities were in good condition and new. Love it here so much! Would recommend any of my friends if they want to visit Edinburgh. See you again! Excellent accommodation. Clean, great location, check in/out system very convenient as no keys or even meetings with hosts. Pillows a little hard and Irish rugby fans who made a lot of noise outside following their win! Very clean, nicely decortated and furnished.